A few weeks ago Eurapco organised the team offsite meeting. It is the perfect moment to review what we are doing as a company and a team. It also helps to just reconnect outside of the environment of the office. I have found that every year, this offsite meeting brings new energy to the team. But this meeting also made me think about our company values. Company values can shape an organization. They are becoming much more important nowadays. Not only when it comes to driving a team in the right direction, but also for employer branding. Many millennials are asking what a company finds important. They ask: Is this an organization I can be proud of? And where I can be happy? We are an Alliance of eight different Partners, which means eight different European country cultures, but also eight different company cultures. We have a very rotating team and every couple of years we welcome one employee of each Partner to become a Eurapco Project Manager for 2-3 years. They bring not only their country’s values, not only their company values, but also their own human values of course. So how could we define values for such a diverse and culturally different company as Eurapco? We are still learning every day, but we based our values off of human values. Everyone that does an assignment at Eurapco should feel trust, openness and respect. The Eurapco values were collectively selected during a team training, but that was a couple of years ago. Now that the team has changed, we have decided to focus on two values that were already in our list: trust and respect. These were selected during the team offsite meeting through an exercise and plenty of open discussion. Company values are important and can give direction to an organization, as I mentioned earlier, but I think it is important to remember that the values mentioned above are mostly human values and they become even more important with such a multicultural team. Once we see our colleague as a friend, someone we will have to work with despite our differences, we can start respecting and trusting each other. This also means that people have to stand up when they see something is going wrong. Why is it that we would never leave our friend without support when we see something is wrong, but we can leave our colleague without because it is ‘not part of my job’ or ‘we don’t want to intrude on their businesses. We are all part of the puzzle that makes up our company, so we need to build bridges to each other. Use the uniqueness of every piece of the puzzle, of every individual. Thanks Pieter. I fully agree with you, building such values in a team is a journey that needs daily involvement and hard work from every team member! A very true story, These days there’s so much impulses from the outside that You can easily loose track. The anchor of Values with which you can truly connect from within yourself will be your Compass. And that means working on them together… it s so easy to go on in the ratrace and forget. Eurapco is keeping this spirit alive! 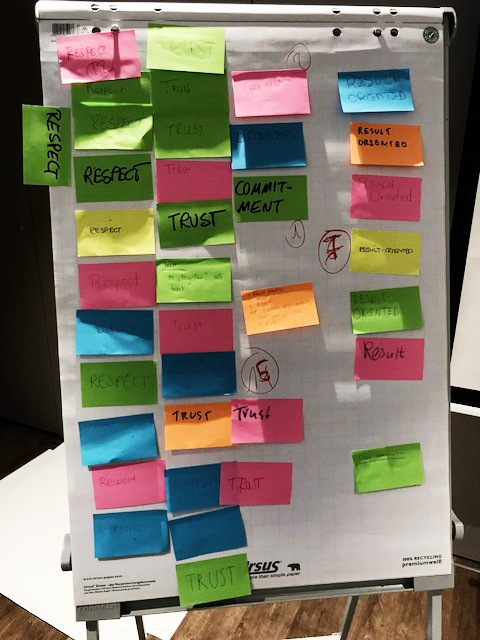 Thank you Jeanette, looking back at how Eurapco agreed on these team values, we really received a lot of support from United Talent in this process.